Cell attachment to the extracellular matrix or to neighboring cells by adhesion molecules, such as integrins, cadherins, selectins or immunoglobulins are not simply used get attached or to resist compression or stretch forces. These proteins do not only have a role with only mechanical consequences, they also act as mechanoreceptors. Having both an extracellular and an intracellular domain (Figure 1), which are connected between each other and, therefore, can exchange information, that is, they allow the communication between extracellular and intracellular environments (Figure 2). When they bind their extracellular “ligands”, their cytosolic domains can trigger internal processes, thus affecting the physiology of the cell. They can interact with some intracellular signaling pathways, affect cell mobility, modify the gene expression, influence the cell cycle, and even affect cell survival. Also, malfunctions of cell adhesion may cause numerous pathologies in organisms, which can be lethal in some cases. In fact, most cells do not differentiate, proliferate or survive if they are not properly adhered. Metastasis requires a previous change in cell adhesion of tumor cells. Therefore, a stream of information from the outside of the cell is transmitted to the cytoplasm thanks to adhesion proteins, which is a similar mechanism to that of the classic receptors of the plasma membrane. That is, it is important for the cells to be attached and to know what type of molecules they are attached to. Figure 1. Extracellular, transmembrane and intracellular domains of the main adhesion molecules. Figure 2. Adhesion molecules can transmit information in both directions: from outside to inside (Figure A, green arrow), and from inside to outside (Figure B, blue arrow). On the other hand, changes in cellular physiology may affect cell adhesion. 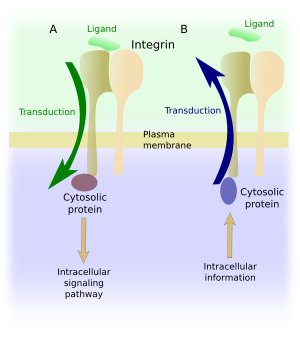 A flow of information is then produced in the opposite direction, that is, certain cytosolic molecules can affect the intracellular domain of the adhesion proteins, which in turn change the affinity for their extracellular ligands (Figure 2). In this way, adhesion molecules behave as classic receptors or, according to many authors, can even be considered as true receptors since they establish a bidirectional way of communication between extracellular and intracellular environments. For example, modulation of many internal cell signaling processes have been assigned to integrins, so wide repertoire of processes that they can be compared to some classical receptors of the plasma membrane. Regardless of the direction, the information is transmitted between domains by conformational changes in the three-dimensional structure of the transmembrane adhesion protein. Cells can also modulate their adhesion status by changing the number and type of adhesion molecules that are present in the plasma membrane. These two variables, number and type, are controlled by cells according to their physiological needs. When a cell is about to move, it has to change its adhesion status. It means breaking the adhesion with the adjoining cells and extracellular matrix to which it is attached to, and synthesize new adhesion molecules that let the cell moves away through the tissue. For example, embryonic cells migrate through the embryo and occupy new places to form new organs by changing their adhesion capabilities. This occurs frequently in the epithelia, where the cells must lose their polarity, detach from neighboring cells, become migrating cells and travel to their new destination. The target area is also recognized by adhesion. A similar mechanism has been proposed for cancer cells when they became metastatic. Cells do not swim, but crawl by establishing adhesion points with the environment, i.e., the extracellular matrix and other cells. The adhesion points work as anchor points to pull on the rest of the cell. Thus, adhesion molecules are indispensable elements in the leading edge of the moving cell, or cell's front, because they anchor the cell and allows the cytoskeleton to pull the rest of the cell forward (Figure 3). Figure 3. Actin filaments are attached to integrins. The motor protein myosin drag actin filaments to these anchoring sites, pulling the rest of the cytoplasm with them (Modified from Ladoux and Mege, 2017). Figure 4. Changes in the expression of the type of cadherin causes cells to lose affinity for their neighbors and to migrate to other places with higher adhesion. 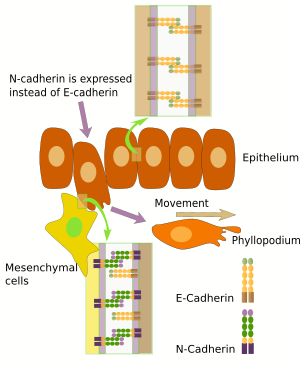 This is what happens with tumor cells during metastasis: N-cadherin is expressed instead of E-cadherin. Cadherins are involved in the loss of adhesion affinity between neighboring cells (Figure 4). Epithelial cells, for instance, express E-cadherins, whereas mesenchymal cells, which usually move, express other cadherins like N-cadherin, R-cadherin and cadherin-11. N-cadherin favors cell movement and it has been shown that the expression of N-cadherin leads to a shift from cell immobility to mobility. In fact, there is a relationship between the cancer progression and the cadherins that are expressed in the cancer cells. For example, cancer cells that do not express N-cadherins are not metastatic, but those expressing this cadherin are. Metastasis can be induced experimentally by inducing the expression of N-cadherin. Besides adhesion, N-cadherins, but not E-cadherins, produce other intracellular effects that favor cell mobility. Thus, when N-cadherin binds its ligand, its extracellular domain interacts with the extracellular domains of growth factor receptors. This prevents the elimination of growth factor receptors from the plasma membrane and, therefore, favors cell survival. N-cadherins also promote the survival and growth by the inactivation of apoptotic pathways. These pathways, which lead to cell death, are usually activated when cells lose their adhesion points. The change of adhesion molecules, which is important to initiate cell movement, is also needed for cell traveling through the tissue. It has been reported that a turnover of integrins and cadherins is required in the plasma membranes of leading edge of moving cells. This turnover is mediated by early endosomes and other organelles involved in vesicular trafficking (Figure 5). Vesicular traffic of integrins and cadherins promotes the invasion of tissues during cancer cell metastasis, probably increasing the replacement and recycling of focal adhesions, which are points of attachment. This mechanism also works in normal cells that move in the tissues. 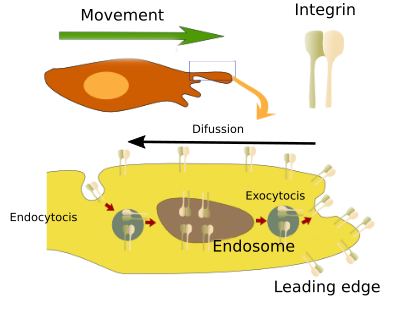 Previously, it was thought that endocytosis carries integrins from the rear of the cell to the leading edge for supplying adhesion molecules to cell extensions (podia) that were projected towards the direction of the movement. However, it looks like that the local vesicular traffic and rapid recycling of the integrins in the area of the leading edge prevents these molecules from diffusing through the rest of the plasma membrane of the cell, thus they are concentrated in the cell front, where they must perform their function. This mechanism is vital for the leading edge to explore, adhere, and drag the rest of the cell. In addition, cell movement is helped by the action of cadherins. Figure 5. Vesicular trafficking keeps a high concentration of integrins in the leading edge of traveling cells by preventing their diffusion throughout the plasma membrane. This is more efficient than degrading and synthesizing new integrins. The movement of a cell population, which occurs during embryonic development and during wound repairing, is a frequent phenomenon based on cell adhesion. Although tight junctions, as well as adherent junctions and desmosomes, are required to preserve the integrity of the epithelia, only adherent junctions are necessary for coordinated cell movements. Adherent junctions are cell-cell junctions allowing a cytoskeleton wiring that extends throughout the cell population and makes cells behave in a coordinated way (Figure 6). For example, covering a wound with epithelium. In cell population movements, actin-myosin complexes are important. The driving forces are generated by myosin II, while the polymerization of actin filaments allows the extension of the cytoplasm of the cells leading the front of the population. Adherent junctions connect the actin network of the entire cell population so that the tensile force of one cell is directly transmitted to the other cells. Figure 6. Connections between neighboring cells mediated by the cytoskeleton and adhesion molecules, especially cadherins and integrins. These junctions allow the coordinated movement of cell populations (Modified from Ladoux and Mege, 2017). The binding of an adhesion protein to its ligand is able to change the gene expression (Figure 7). Many cytosolic proteins can interact with the intracellular domains of adhesion molecules. These proteins, which are intermediaries between the adhesion molecules and the cytoskeleton, can enter the cell nucleus and behave as transcription factors or modulate the activity of transcription factors, changing the expression of some genes. They have amino acid sequences that are recognized by importins and exportins. Importins and exportins take proteins into the nucleus or out of the nucleus, respectively, by interacting with the nuclear pore complexes. However, when the intermediary proteins are attached to the cytosolic domain of the adhesion molecules, the recognition amino acid sequences are hidden. Figure 7. Molecules associated to the intracellular domain of adhesion molecules can enter the nucleus. There, they inlfuence expression of some genes. Cytosolic or nuclear location depends on the amount and the binding state of the adhesion molecules (Modified from Aplin and Juliano, 2001). JAB is a protein that can be found either anchored to the cytosolic domain of integrins or in the nucleus (Figure 7). The location of JAB depends on whether integrins are bound to its ligand or not. Inside the nucleus, JAB activates c-jun transcription factors, which promote gene expression. β-catenin can be linked to the cytosolic domain of E-cadherins (Figure 7). 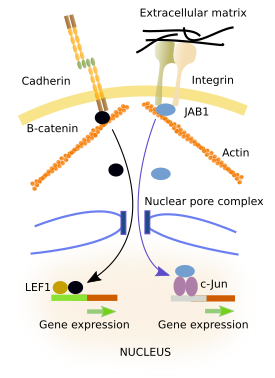 β-catenin can enter the nucleus where it gets associated with LEF-1 leading to the expression of some genes. It seems that the number of β-catenin linked to E-cadherins does not depend on the binding state of E-cadherins, but on the amount of E-cadherins located in the membrane, which in turn depends on the general level of adhesiveness and the state of differentiation of the cell. A large amount of E-cadherin molecules in the plasma membrane indicates that the cell is strongly attached, and a high amount of the total cellular β-catenin is linked to them, i.e., in the cytoplasm. Thus, less β-catenin is left to enter the nucleus. ZO-1 is a protein that can be associated with tight junctions. It can be released from tight junctions and transferred to the nucleus. Inside the nucleus, it affects the expression of certain genes, which seems to be necessary for the reorganization and differentiation of epithelia. Adhesion molecules and their associated proteins can influence some cellular signaling pathways. Cadherins themselves can interact with the extracellular domains of growth factor receptors. β-catenin, protein associated to the cytosolic domain of cadherins, is also regulated by the Wnt signaling pathway (Figure 8). Wnt affects the proliferation, differentiation and homeostasis of cells by activating Frizzled and LRP receptors. Wnt intracellular signaling needs β-catenin for changing gene expression. Activation of Frizzlet and LRP by Wnt prevents phosphorylation of β-catenin so that β-catenin is not degraded. However,β-catenin availability depends on the number of cadherins. In this way, adhesion and Wnt influence each other through β-catenin. Figure 8. 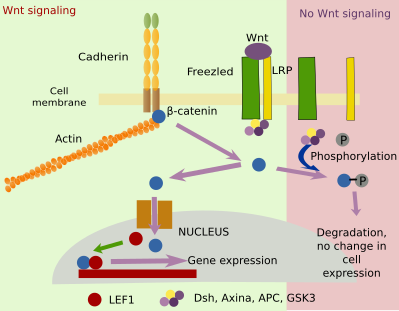 Interactions between molecules associated with adhesion proteins and other signaling cascades occur in the cytoplasm.β-catenin is associated with cadherins and also is influenced by the signaling pathway initiated by Wnt. It should be noted that coordination between cadherins and the activation of the Wnt pathway is necessary to produce changes in the gene expression (Modified from Gordon and Nusse, 2006). Progress through the different phases of the cell cycle affects cell adhesion and adhesion affects the way the cell cycle progresses. For example, the binding of integrins to their ligands is required for many cells to move forward from phase G1 to phase S. The attachment of integrins activates intracellular signals that synergistically cooperate with growth factors to promote the cell cycle. On the other hand, the adhesion of the cadherins inhibits the advance of cells to the next phase. In cancer cells, adhesion signaling pathways affecting the cell cycle are inhibited. Phe binding of integrins to their ligands causes activate intracellular molecules that eventually promote cyclin D synthesis and stability, which is needed for the activity of the cyclin-dependent kinase found at the core of the molecular machinery that allow the progression of the cell cycle forward to phase S. In the case of cadherins, when they are linked to other cadherings of neighboring cells, they also bind α- and β-catenins to their cytosolic domains, which in turn bind actin filaments. When the extracellular domain of cadherins are not linked to other cadhering, β-catenins are released and can travel to the nucleus, as describe above. In the nucleus, they promote the expression of cyclin D and of other proteins that stimulate proliferation. Integrin and cadherin molecular pathways do not work independently. 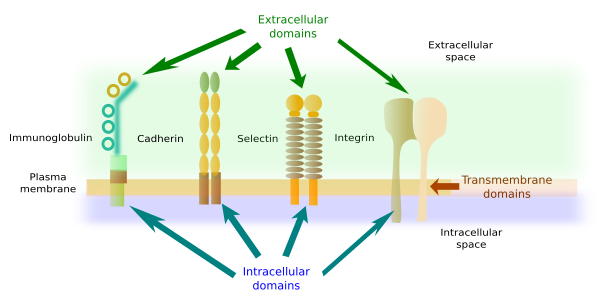 For example, the integrin pathway activates Src protein, which increases cadherin internalization and degradation. During mitosis, many cells lose adhesion and become rounded, but cytokinesis and starting the phase G1 require cells to be attached again. At the beginning of mitosis, many proteins that interact with the cytosolic domains of the adhesion proteins are phosphorylated, which contributes to decrease the cell adhesion. These phosphorylated proteins move to other parts of the cell, where they perform functions related to mitosis. Cytokinesis requires the action of integrins because if they are inactivated the separation of the daughter cells does not occur. Both cadherins and integrins have been involved in settling the position of the cytokinesis furrow that ultimately separates the two cells. They are also involved in asymmetric divisions (when the two daughter cells are not equal).